Web site manager: Eugene (Gene) D. Johnson, son of Ellsworth and Rowena Heffly Johnson. Grandson of Adam LeRoy (Roy) and Wilhelmina (Minnie) Blum Heffley, g.grandson of George and Elizabeth Gillespie Heffley, g.g.grandson of George Henry and Lucy Gordon Heffley, g.g.g.grandson of William and Mary Cain Gordon, g.g.g.g.grandson of John and Mary Duke Gordon, and g.g.g.g.g.grandson of George and ? Forbes Gordon. The John Gordon Family is well documented after 1760 when he married Mary Duke and then moved to Green County Pennsylvania. However, no one has yet been able to find out for sure if he is either of Scotish or Germany decent. This is discussed in detail in a manuscrept titled "John Gordon" that was written by one of the Gordon grandchildren, Donald Gordon, in 1926. This Gordon manuscript has been included in this family history research. It is located on the web page titled: John Gordon Manuscript. "An excellent genealogy has been written about the Gordon family (NOTE: I beleive he is refering to the John Gordon Manuscript). It states that John Gordon was born near Baltimore in 1739. There is some controversy as to his nationality, some of the family claiming to be German stock, others stating he was Scottish. It is reported that he spoke with an accent, scarcely understood by his listeners, and used to support the theory that John Gordon was of German decent. It is also pointed out that he lived amid a German settlement in Frederick County, Maryland, and that his children married into families of that nationality. The strongest argument supporting the theory has been overlooked. That is the custom of using the name "John" several times in the naming of sons. It is used by the Germans as a term of endearment, as a prefix to given names. This happens in the family of John Gordon, though it must be admitted that the name is distinctly Scottish. In 1760, John Gordon married Mary Duke, and in 1780, moved to the vicinity of what is now Fairmont, West Virginia. He definitely was on "Rich Hills" in 1793, and perhaps earlier. Here he died on March 9, 1816. Mary Duke had died in 1789." 1. John Gordon, that married Mary Duke, was a Catholic. His son John Adam Gordon donated the logs for the foundation of St. Ann's Catholic Church at Waynesburg, Green County, Pa.
2. It states on his tomb stone in Franklin Twp. Green County, Pa that John Gordon: "Ancestor of the Gordon Family of Green County, Born in Scotland A.D. 1739, Removed to Germany thence to America". 3. He was married before 1761, the birth of his oldest child Elizabeth, making him approximately 21 years at the age when he was married. 4. His wife Mary Duke descends from the Calvert County, Maryland, Dukes. The will of James Duke 3rd, dated Feb 2nd 1754, names his sons: James, John, Leonard, Basil, Andrew, Benjamin; and his daughters: Martha Mackall, and Mary Hellen. His dwelling plantation was a part of "Brook Place Manor". James Duke 3rd operated a watermill at the head of Battle Creek. The will was probated Aug 21, 1754. 5. His son John Adam Gordon married Cassandra Holland in Loudoun County, VA approximately 1789 when he was 27 years old. 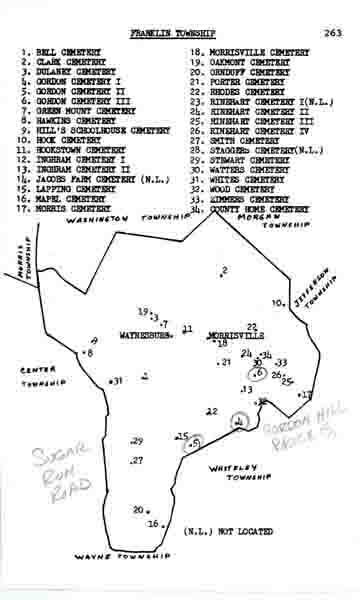 This shows a movement of the family of Gordons from Baltimore to Calvert County. 6. The history book by Howard Leckey," The Tenmile Country" states that he feels that John Gordon that married Mary Duke was born near Baltimore and that the tomb stone is in error." "I would like to give you some background information as to why would a member of the most powerful and richest clan in southern Scotland want to leave his situation and come to America. 1. The defeat and death of King Charles 1st of England by Cromwell & the Scottish Lowland Clans who were mostly Presbyterians. This accounts for the migration into Germany by thousands of Northern Catholic Scottish Clans after 1645. 2. The first Jacobite Rebellion of 1705. 3. The second Jacobite Rebellion of 1745. I feel (Jim M.) that it was this third event that forced our John Gordon and perhaps his parents and other members of his clan to flee to Germany. There were many Gordons who were defeated in the above events that were tried, imprisoned and some of the leaders were hung and quartered like beef to have their bones picked clean by the birds. There was no better haven in America Than the Catholic sections of Maryland, such as Prince George County, Anna Arundel County, Baltimore County, as well as Calvert County. These were inhabited mostly by the Catholic Norman English Nobel Families who were defeated by Cromwell in 1645. Lord Baltimore himself was placed in a secondary position in England by this Protestant group. 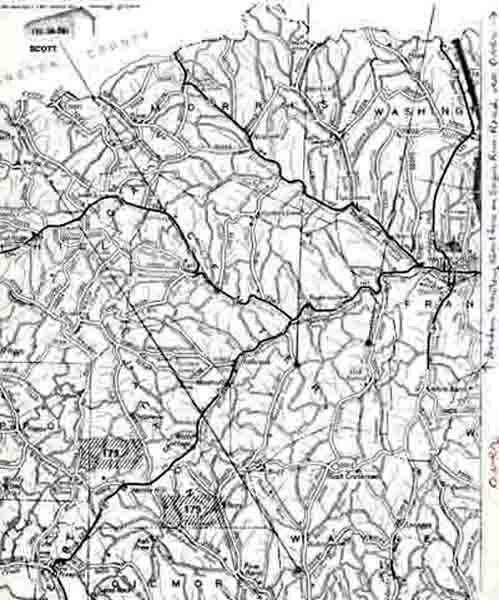 It helps to explain why this family of Gordons who had money to purchase land and who had better than average education kept to the outlying reaches of the Maryland and Virginia Colonies where they would be less likely to be recognized by the British authorities. I have never (Jim M.) been able to identify the boat that carried them to America. Jim Meighen Spent many years researching the John Gordon family. I visited the Green County Historical Museum in 1985 and his genealogy records of the Gordon family were displayed in a glass case. The visit to this Museum showed me the Gordon History that has evolved over the years within Green County. 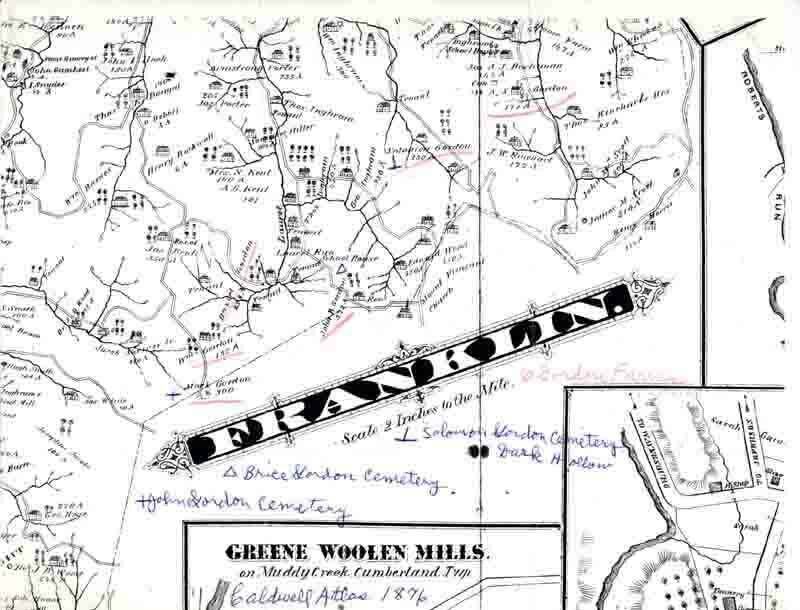 The Gordons were/are prominent members of Greene County. Many were in the legal profession and some were Judges. During this visit, I was able to get a copy of the John Gordon family history manuscript. The complete manuscript can be accessed from the home page identified as the John Gordon Manuscript. The following are some excerpts about my g.g.g.grandfather William Gordon copied from this manuscript. (Note: Mary Carroll is no relation to us, Eugene Johnson). About 1779 William Gordon and his wife moved with the other Gordons to Green County, Pennsylvania. William and his brother John Adam I "took up" a good-sized tract of land in partnership, which tract they later divided. The "old Billy barn," built by him, is still a landmark on the "Gordon Homestead". William and Mary Carroll had eleven children. Mary Carroll died in 1814." "There was a bit of a controversy over the nationality of John Gordon. The Gordons of Green Co., PA strongly maintain that John was a German because he spoke in the Pensylvania-Dutch dialect, but this could have come from his living among the Pennsylvania-Dutch people in Maryland, Virginia and Pennsylvania. The Ohio Gordons declared that he left Scotland in haste in order to save his life (because of being a Highlander and being involved in some political matter) he fled to either France of Holland and thence to America. John and Mary Duke Gordon lived near the Monocacy River in Frederick Co., Maryland as early as July 3, 1777, and probably they settled there even before that time. They migrated to Monongalia Co., VA about 1784-1789. 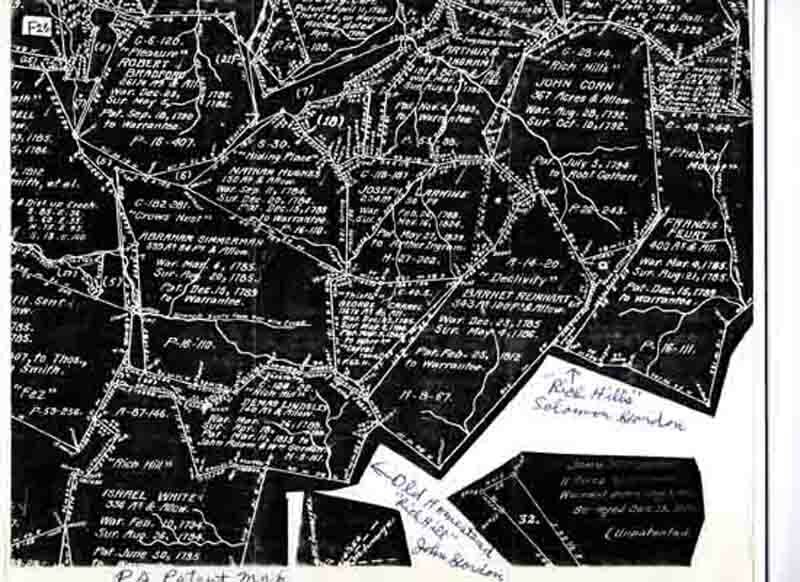 They were poor farmers and didn't prosper there so they commenced to migrate to Green Co., PA, where John Adam I and Philip bought tracts of land and the families settled on what was known ever since as the "Gordon Homestead". The purchase price was not a very large sum, but it crippled them financially to such an extent that the whole family had to begin farming with only a single horse among them. They also had a few sheep, which they had to guard carefully from wolves. With great energy and a strong clannish spirit they set to work, and gradually established themselves as "one of the strongest and most respected families of the region. The Patriarch (John Gordon), lived in a little cabin near where the "Old Billy Barn" (build by William Gordon) stands, beside a cattle trough and an old apple tree that has lately blown down. In spite of both age and poverty he (John Gordon) now took onto himself another wife, Sibbly Main, a widow with four daughters. Old John had a tough bargain of it with this new family. Neither she nor the children were ever recognized by the rest of the family (statement of William Holland Gordon in 1901). " "After Mary Carroll died, William remarried to Mary Cain. They had eight children. Lucy was child number 7 and was born Feb 6, 1827. Lucy married George Heffley in 1846. Mary Cain died in Sumerset, Ohio, Aug 13, 1868. 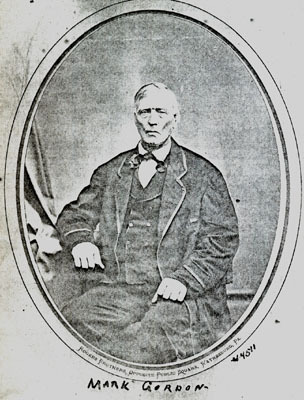 William Gordon was affectionately remembered by the Gordons of Green County. He acted as a father to some of them, and was generally recognized as the head of the clan. 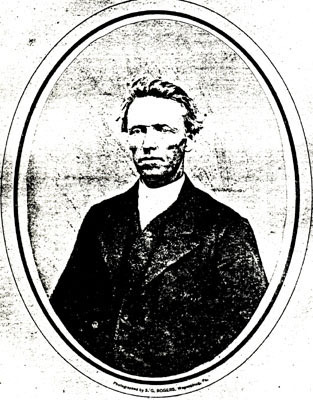 About 1830, with all his family except his daughter Nancy, he emigrated to Perry County, Ohio, where he acquired land and where he died November 5, 1849. Mary Hewitt Kuster wrote, May 27, 1901: "I had heard that Grandfather (William Gordon) could not write, but I knew that there were no opportunities in those days, and I knew also that when he came out to Ohio he was referee and Judge by public consent in all matters needing counsel and judgment in all his part of the country". For seven generations of one family to live in the same house is considered unique. But when the house is also considered a rare example of early American architecture, that merits attention. 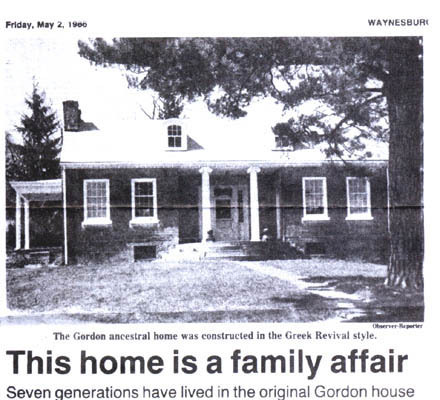 The house is an adapted Greek Revival of cut stone and has been in the Gordon family of Waynesburg since it was built in 1843. 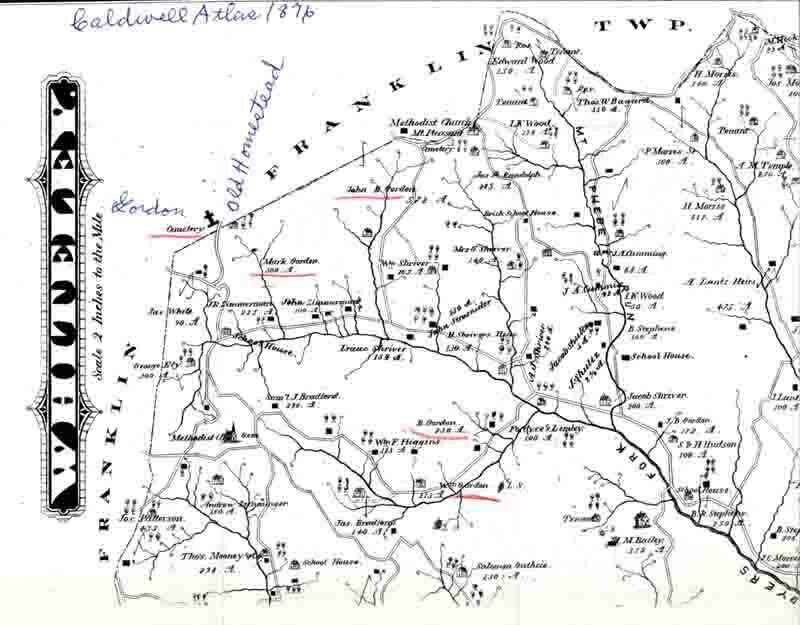 The original tract of land was purchased by John Adam Gordon who settled in Whiteley and Franklin Townships in 1796. �In 1840�, Mrs. Wermingler continued, �my great-grandfather, John Brice Gordon, built the house and very little has been altered except for a kitchen added in the back of the house." The home is an H-shaped design with two Greek columns in the front. Visitors approach on a curved walk leading to a curved stone patio. There is even a stile (upping block) in the front yard. It was used to better mount a horse. The side view of the house is of a gable design. Greek Revival architecture flourished in Western Pennsylvania in the early 1800�s but few of those homes still exist. The John LeMoyne house in Washington is the nearest example of this style. Mrs. Wermingler owns a book of photographs of early Western Pennsylvania architecture in which it is mentioned, �people had no idea there was any house in the world not built of logs�. Bruce Wermingler, son of David and JoAnn Wermingler, now lives in the house. He moved in after the death of his great-uncle, George W. Gordon in 1979 at the age of 80. Mr. Gordon lived in the house for many years.